Hundreds of Venezuelan doctors have marched through the country's capital, Caracas, demanding the expulsion of Cuban doctors. President Hugo Chavez says he invited the medical staff into the country to provide free health care for the poor. But Venezuela's doctors, who are also asking for better wages, say the Cubans are taking their jobs. They say the government is trading its oil revenues to pay for some 20,000 Cuban doctors and dentists. 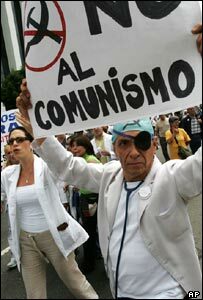 Dressed in white medical gowns and bearing national flags, some 400 doctors and medical staff carried banners reading 'No More Cubanisation!' as they marched. Under a special programme set up by Mr Chavez and his ally Cuban President Fidel Castro, Cuban doctors, dentists and nurses work in newly set-up medical centres in Venezuela's poorest areas. In exchange, the oil-rich country sends Cuba 90,000 barrels of oil a day. The "Barrio Adentro" or "Into the Neighbourhood" programme has won Mr Chavez great popularity among the country's poor. It is believed to have helped him win a referendum last year. But organisers of the march say salaries have remained unchanged for four years and many cannot now find work due to the influx of Cuban doctors. They say that while the Cuban-staffed clinics are equipped with medicines and modern machines, public hospitals often lack basic medical equipment. "Venezuelan doctors are underpaid and many are unemployed," trauma specialist Pedro Carvallo told Reuters news agency. He said many Cuban doctors do not hold proper medical qualifications. "These Cubans are political agents who come to indoctrinate, not to work as doctors," Mr Carvallo said. Mr Chavez says the Cubans have accepted jobs in areas, including crime-ridden slums on the outskirts of towns, where many Venezuelans refuse to work. Fidel Castro has said that he aims to increase the number of Cuban health care workers in Venezuela to up to 30,000 by the end of the year.